One of the things I miss the most is eggs. Love their taste, love their texture. Especially that they take such a central role in our cuisine. After turning vegan, I was dedicated to find some solutions for the egg deficiency. As for omelettes, the success is almost perfect. In case you don’t have this one where you live, try to play with different brands until you reach a good result. 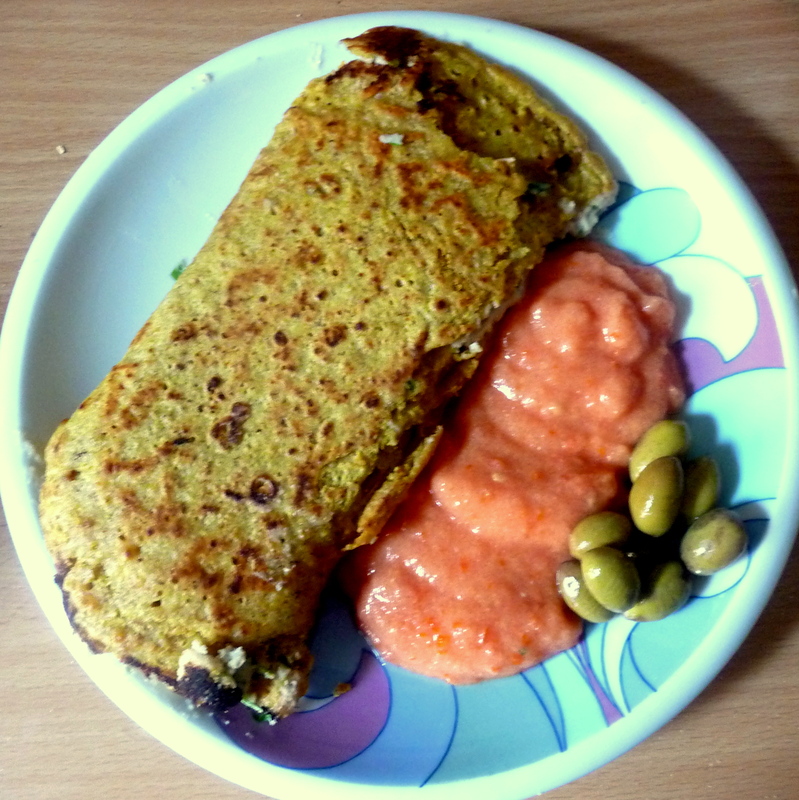 For the basic omelette you will need: 1/2 cup chickpea flour, 1/2 cup water, 1 tsp oil, good, non-stick frying pan with a lid. To reach better outcomes I’d also suggest a pinch of baking powder and a pinch of turmeric, to get a nice, yellow color. In case you don’t like the chickpea flavor and want to reduce it, swap some of it with another flour, such as soy, red lentils, or even very fine oats. To enhance an eff flavor you can season it with nutritional yeast and Kala Namak salt. Any kind of herb or vegetable can be friend beforehand and have the flour mixture poured on top. Some suggestions will follow. Mix in a bowl 1/2 cup of chickpea flour, 1/2 cup of water, pinch of salt, and recommended pinch of baking powder and a pinch of turmeric. Stir well until there are no lumps left. Warm a pan over a medium-high flame, and add 1 tsp of oil. Pour your mixture and cover. Let it fry for around 3 minutes, until the bottom is stable. flip carefully and let the other side be fried too, around 2 more minutes. Serve with toast, veggies and your favorite spreads. In case you want some vegetables in your omelette – fry them first and then pour the mixture on top, don’t mix the vegetables into the mixture, it will make it break down. The first option will be spring onions and button mushrooms. Just fry them quickly in some oil, season with black pepper and cover with the mixture. Another option will be the green way – first fry some onion rings, when they are already golden add our favorite greens, parsley, coriander, rocket, carrot greens, celery greens, collard, kale… basically everything you have left in your fridge can go – just let them lose some liquids in the pan before you cover them with your mix. Second could be a filled omelette. You will need to make a plain one and prepare a filling. The best would be a cheezy one – I like the cashew cream option. You’ll need 1/4 cup of cashew nuts, not roasted, crushed to powder in a blender. Then, mix with 1/2 the amount of water, 1 teaspoon of fresh lemon juice, pinch of salt and some nutritional yeast for the cheezy flavor. Feel free to add dried herbs, garlic or finely chopped green olives to upgrade your filling. You can play with the amount of water to reach perfect texture. Just spread generously after flipping, and then roll gently around it. 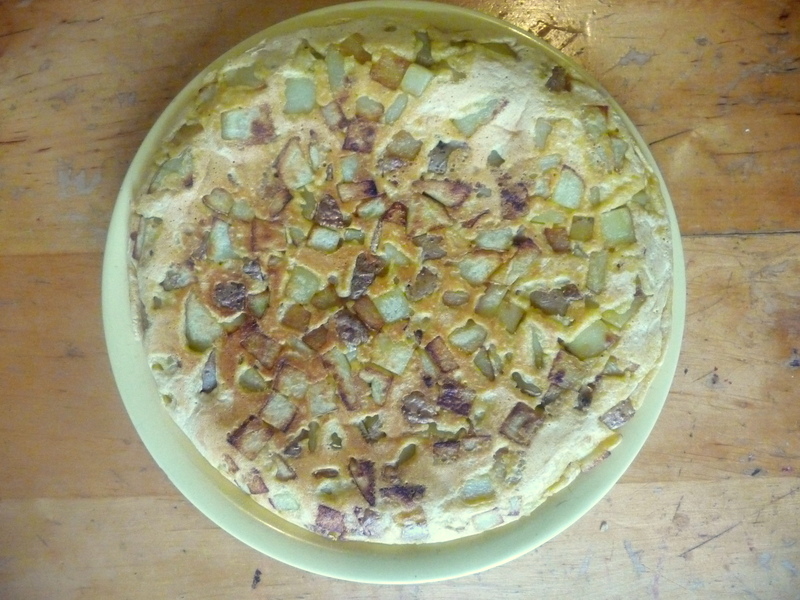 Third, and maybe the most comforting one, for a late breakfast on a lazy day – Spanish tortilla. Dice some potatoes, fry them over a medium flame on a covered pan until they get soft. Then, increase the heat, remove the cover and add some onions. Cover with the mixture (you’ll need more than the basic amount, you need to have the potato cubes covered), reduce heat, cover and keep on the flame for 3-4 minutes, until the bottom is solid. Move to a plate and flip back to the pan, repeat the last step. Serve with some cold gazpacho. Posted in Starters, SubstitutesBookmark the permalink. 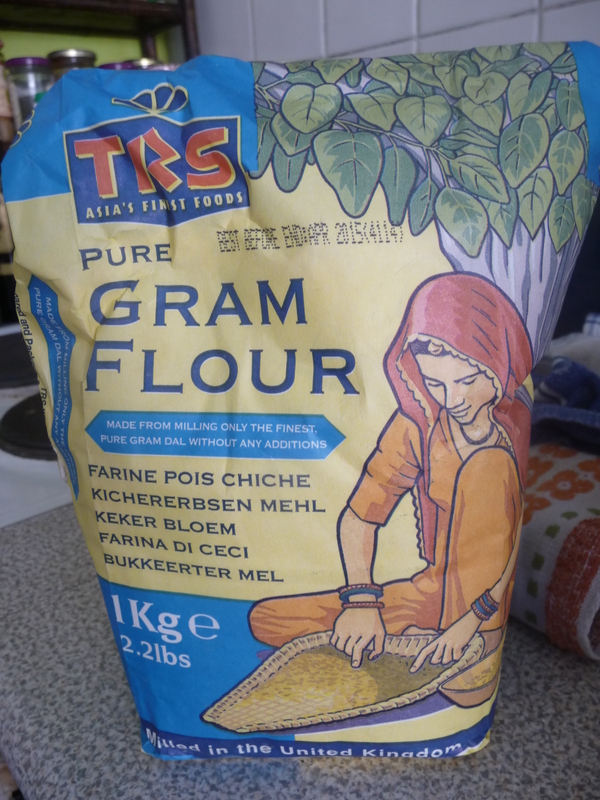 Today i heeded your words about problems in buying besan flour. I bought some at a store where you can scoop out as much or as little as you want from a bin (There are quite a few of these stores around Sydney). That way if it’s bad you don’t have to throw away a whole package. I hate to waste food. Tomorrow morning breakfast I will try making an omelette and will report on how it turned out. Thanks to Zahi for your excellent tips. Looking forward to hear how it went.